Arrowhead Plant For Sale Online. Low Prices. Fast Ship! Arrowhead Plant - Syngonium podophyllum is a hardy pond plant with heart-shaped, broad green leaves. Arrowhead Plant has arrow-shaped leaves change to a grow 2" to 3" tall and sport fragrant flowers that bloom throughout the summer months. As Arrowhead Plant leaves mature, they take on silvery variegation. The roots of the Arrowheads plants are robust. This plant makes excellent houseplants and only need the partial sun to flourish. Arrowhead Plant will grow on a trellis or any other structure. These plants do well in wet, but not soaked soils. Just a little bit of fertilizer in summer and spring months is all that is needed. Arrowhead Plant has a wide array of foliage that can bloom white, purple, pink or even silver. When planning your outdoor wetland mitigation space, arboretum or pond; the arrowhead plant should be a top consideration. Also known as American evergreen and five fingers, the arrowhead plant at early stages has leaves resembling the shape of an arrowhead and at maturity can have three to five finger-like sections. The arrowhead plant can be maintained in a lush, bushy type configuration ideal for spot greenery, or they can be allowed to mature and become a climbing vine which can make a beautiful trellis or tropical landscape for your favorite area. With Arrowhead Plant variety of colors and large fleshy leaves, the arrowhead is the perfect choice to add that calming tropical feel to your home. The Plant, also known as Duck Potato, Indian Potato, and Wapato, has a tuber eaten by native Americans. Arrowhead Plant grows in colonies near water. Arrowhead Plant has thin, white roots. 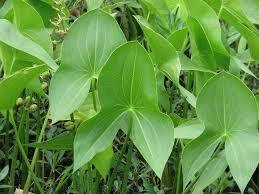 Wedge-shaped leaves on Arrowhead Plant are edible to ducks and geese and other type wildlife. 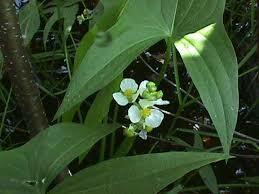 Arrowhead Plant blooms white in summer and has purple stalks in fall.